Golf Service offer shuttle transport between the airport and your accommodation, and the golf courses. 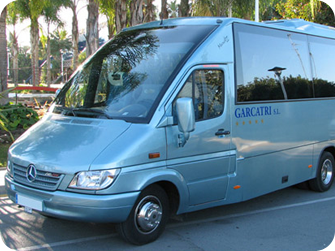 Shuttle transport can be a good choice if you are a big group of golfers that do not want to rent cars or have to struggle with local taxis. We can offer 2 different packages depending on your request. *Only for golf courses in Costa del Sol. Option 3: Request. Create your own trip. Option 1: Transport between Malaga Airport and selected destination municipality. Option 2: Transfer between Malaga Airport, your hotel and selected number of golf courses. Please observe: Only for golf courses in Costa del Sol, Spain. See our rates in the lists below. *) Only golf courses on the Costa del Sol.